Two new studies identify the black material found in the lungs of smokers who died of emphysema as mostly insoluble nanoparticulate carbon black. Physicians could only guess – until recently – at the composition of the black material found in the lungs of smokers who died of emphysema. But research by Baylor College of Medicine and Rice University shows the deposits consist of carbon black nanoparticles that, once embedded in the cells that line the lungs, are impossible to remove. Kheradmand, Corry and their colleagues studied the lungs of mice exposed to cigarette smoke and the lungs of human smokers with emphysema. They found the black material accumulates in the dendritic cells that serve as messengers in the human immune system and in the related antigen-presenting cells of mice. They sent samples of the material to Tour and his students, who identified it. Ran You, a graduate student in Kheradmand’s lab, then introduced pure nanoparticulate carbon black, in roughly the same proportion of that found in the lungs of human smokers, directly into the noses of mice and found that it caused the animals to develop emphysema. Tour said the finding is not limited to tobacco smoke. Other products, including tires, contain carbon black nanoparticles in significant amounts. While carbon black particles about 15 nanometers wide induced the most severe response, Tour said increasing the size of the particles to about 70 nanometers or oxidizing their surfaces greatly reduced their toxicity, based upon data presented in the eLife paper. Kheradmand and You found the smaller carbon black particles caused double-stranded breaks in the cell’s DNA, a state that is very difficult to repair, and activated T helper 17 cells, which induced chronic inflammation in the lungs. In the Nature Immunology article, Corry built upon eLife findings by studying the role of microRNA-22 as a link in the chain from exposure to carbon black to development of emphysema. “We used to think of these tiny pieces of genetic material as junk,” Corry said. “Now we know that they are off-switches for protein-coding genes. “This could be a therapeutic finding. We could design drugs to inhibit the microRNA through inhalation,” he said. Co-authors of the eLife paper include Lu, Ming Shan, Xiaoyi Yuan, Lizhen Song and Amanda Hendrix, all of Baylor; former Rice postdoctoral researcher Jacob Berlin of the Beckman Research Institute in Duarte, California; and Errol Samuel, Daniela Marcano, Zhengzong Sun and William Sikkema, all of Rice. Nature Immunology co-authors include You, Antony Rodrigues and Tianshu Yang, all of Baylor; and Samuel, Marcano and Sikkema of Rice. Corry, Kheradmand and Tour were authors on both reports. The National Institutes of Health and the U.S. Veterans Affairs Office of Research and Development supported the research. Kheradmand is a professor of pulmonary medicine at Baylor. Corry is a professor of medicine and chief of the Division of Immunology, Allergy and Rheumatology at Baylor. Tour is the T.T. and W.F. Chao Chair in Chemistry as well as a professor of materials science and nanoengineering and of computer science. 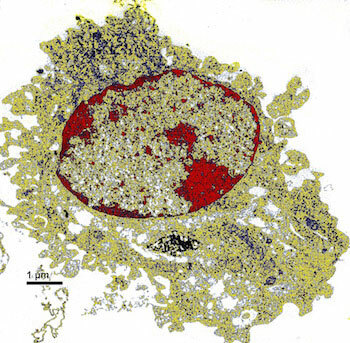 Be the first to comment on "Nanoparticulate Carbon Black Found in the Lungs of Smokers"